It is common in our apartment to buy more bananas than we can manage to eat before they go to the dark side, but we have found a very simple solution to all these bananas that go brown before we desire…BANANA BREAD! Both my roommate and I have our tried and true banana bread recipes that we both lover very, very much but I couldn’t help but be drawn to the Banana Bread with Cinnamon Crumb Topping in the September 2008 issue of Bon Appetit. 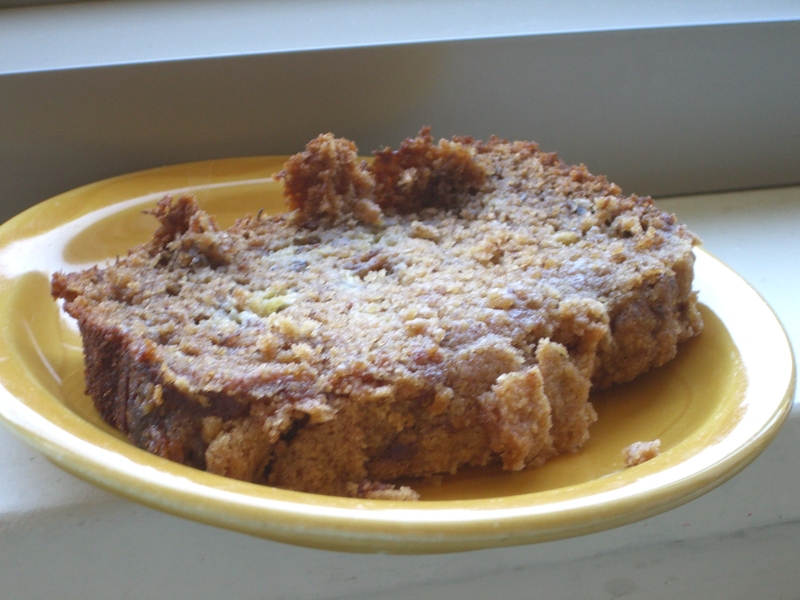 This banana bread is amazingly rich with a taste of honey mixed into the batter. This time in making the banana bread I switch up the topping to a buttery-melt-in-your-mouth crumble. I’ll provide both crumble recipes so you can pick the one that suits your mood best. Bake Bread until tester inserted into center comes out clean, about 1 hour. Cool bread in pan 30 minutes. Turn pan on it’s side; slide out bread, being careful not to dislodge topping. Turn bread right side up and cool completely. “Banana Bread with Cinnamon Crumble Topping.” Bon Appetit. September 2008: 135. Mix all ingredients together until crumbly. Use in place of cinnamon topping.